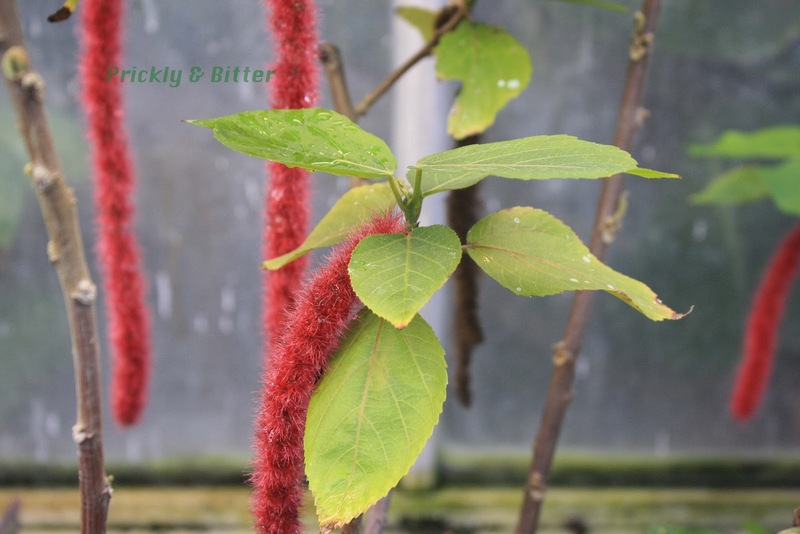 The chenille plant, also called the Philippines Medusa and the fox tail, is native to a set of small islands off the coast of Australia, between Australia and Indonesia. It has now been domesticated throughout much of the world with a warm climate year-round (it is not frost-tolerant) such as the southern United States, Mexico, Brazil, and Belize. It is still common throughout all of its native range, and much of its naturalized range. The chenille plant can almost be considered a domesticated plant in some areas. It no longer does well in the wild in some spots it has been introduced because we (as humans) have subjected it to artificial selection to favour traits we like. 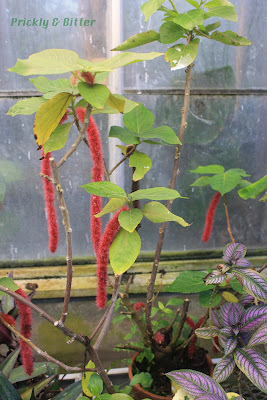 The inflorescences, while usually having quite a bit of "fur" on them, were much shorter and much less hairy in the wild ancestors than the ornamental varieties sold today. This is considered artificial selection as this would never have happened naturally in the wild; increasing the hairiness of the inflorescences actually decreases the plant's ability to disperse their seeds. Not a good thing if you're the plant! There are also some cultivars of ornamental plants that have orange and even yellow inflorescences as opposed to the "natural" red colour (but this has also been artificially selected for increased intensity). The family that this plant belongs to is called the Euphorbiaceae, or the spurge family (sometimes the euphorb family). 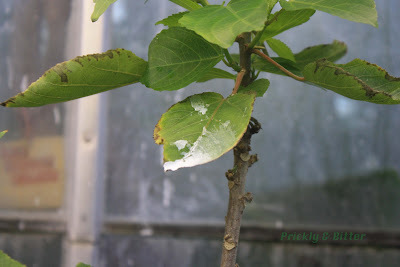 The easiest way to determine if a plant belongs to this family is if it produces a milky white latex from the leaves when they are broken (which you can see dried on the leaf's surface in the third photo). If so, chances are much higher it belongs to this family than not. If you have sensitive skin like I do, you'll also probably find out the hard way that euphorb latex is extremely irritating to sensitive skin, completely separate of whether or not you have a traditional latex allergy. This should probably suggest to you that perhaps this plant shouldn't be consumed if it has the ability to burn your skin on contact, and you would be correct. 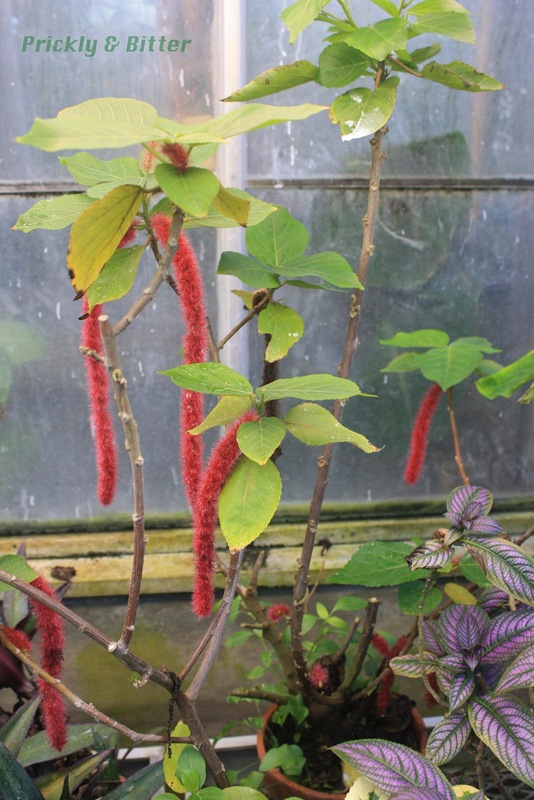 The chenille plant is deadly toxic to small animals, and would make any human that tried to eat it very sick. 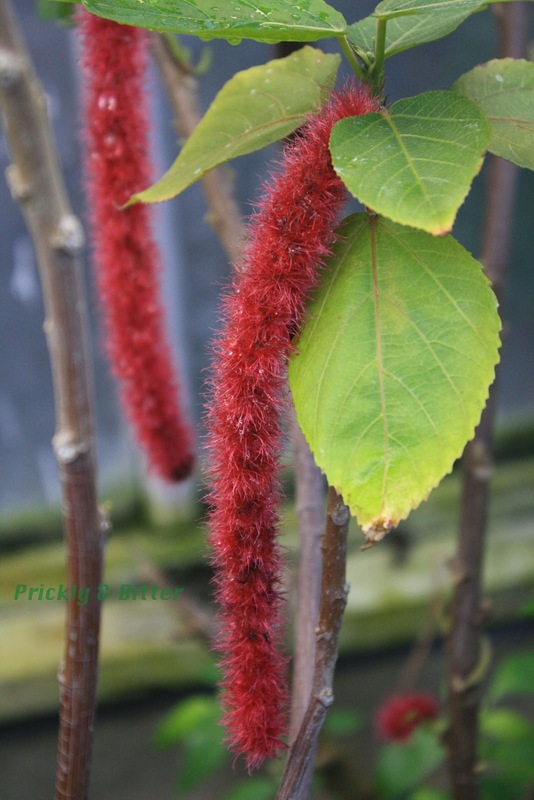 If you have cats, you might want to reconsider before buying this plant (either to plant outside or as an indoor plant); my cat would mistake the inflorescences for cat toys in a heartbeat and it would likely be a deadly mistake.